Many of our signs give great advice, but none quite like our "mottos!" 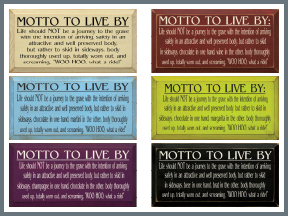 Funny words of wisdom grace our solid wood signs, encouraging you to live life to the fullest! With over 40 colors to choose from, your solid wood sign from Sawdust City will look great anywhere!